Thursday marks Minor League Baseball's return after a long offseason. Just how long? The Fresno Grizzlies defeated the Columbus Clippers, 7-0, in the season-ending 2015 Triple-A National Championship last Sept. 22. When the first pitch is thrown in Richmond, that'll bring a streak of 198 days (roughly six-and-a-half months) to a welcome close. 10:30 a.m. ET: You're up. You're awake. You're caffeinated and well-nourished. You've put your favorite Minor League cap on and buttoned up your replica jersey. You're ready for baseball. The problem is first pitch isn't for a couple more hours, and the pangs of anticipation are kicking in. Fend them off by making absolutely sure you're set to follow every pitch this Minor League season. Start by downloading the MiLB.com First Pitch and Inside the Park apps. The former allows you to check out stats and scores from all your favorite Minor League clubs as well as receive push notifications when news breaks in the Minors, like when a top prospect is headed to the Majors. Inside the Park is a great option to get your phone to work for you in the ballpark with ways to participate in on-field contests and order beverages directly to your seats. Both apps are available for download in the Apple App Store and in the Google Play store. 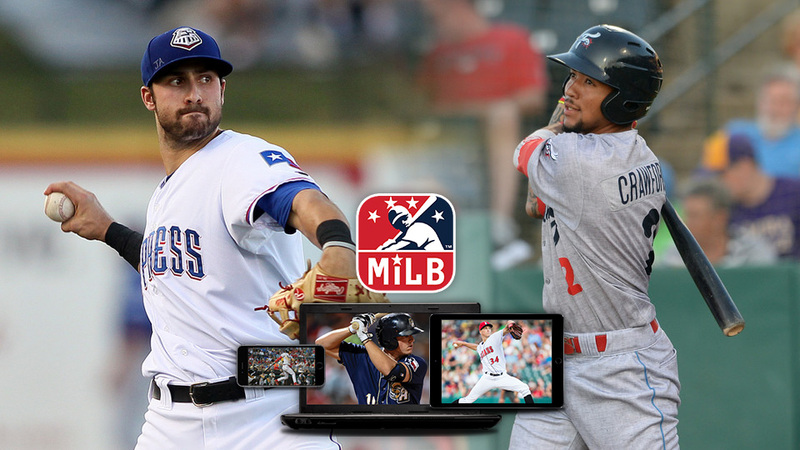 With those in place on all your devices, turn your attention to MiLB.TV, and make sure you have a current subscription for that. Yearly subscriptions cost just $49.99, or you can pay $12.99 per month. This season, that access will get you every Triple-A game and games from all but three Double-A parks as well as select other clubs, All-Star Games, playoff games and the Triple-A National Championship. In total, that's more than 5,000 Minor League games and on-demand archives that can be streamed on your laptop, iPad, iPhone or iPod touch. You'll want to have that set up early. 10:57 a.m. ET or thereabouts -- Those in the know already know, but those who don't know should know that Ben's Biz Blog is a must-read for all Minor League baseball fans, so head over there to check that out. Written by MiLB.com's Ben Hill, the blog focuses on the business and culture of Minor League Baseball. In other words, all of the fun (and downright weird) goings-on that occur away from the playing field are covered on a daily basis. Ben has visited 135 Minor League ballparks over the past six seasons, and his 2016 travel schedule will be announced shortly. If the concept of "exploring America through Minor League Baseball" appeals to you, then make sure to follow along. 11:30 a.m. ET -- With baseball so close you can taste it, get your last-minute studying in with our Prospect Primer series. Read up on the shining stars, full-season debutants, loudest tools and prospects at a crossroads in each of the game's 30 farm systems. Is J.P. Crawford of the Phillies the game's next great young shortstop? How will the Red Sox use their wealth of particularly young prospects such as Anderson Espinoza? Will top-10 prospects Lucas Giolito and Trea Turner both help out the Nationals in the Majors? Each of those questions and many more are answered. Also, don't forget to read up on our list of under-the-radar prospects to get a chance to know some of each system's best lower-ranked players before they make it big. If you'd prefer to listen rather than read, we've got your ears covered as well with the MiLB.com podcast, "The Show Before the Show." The latest episode of the pod has the MiLB.com team of writers taking you on a whirlwind through the Prospect Primer series, and be sure to head back into the archives to hear interviews from some of the game's top prospects, such as Tampa Bay's Blake Snell, Atlanta's Dansby Swanson and other figures of note in Minor League Baseball. To make sure you don't miss any future episodes, head over to iTunes to subscribe to TSBTS. 12:15 p.m. ET -- Go grab lunch. You'll need your nourishment for the hours ahead. 1:05 p.m. ET -- Baseball! And this year's Minor League opener is kind of a head-scratcher. The Richmond Flying Squirrels are playing their home opener on April 14. Yet the Richmond Flying Squirrels are hosting a ballgame at their home of The Diamond today. So what's going on here? Today's Opening Day matinee is technically a Hartford Yard Goats home game as this new Eastern League entity begins its existence after relocating from nearby New Britain following the 2015 season. The Yard Goats' home of Dunkin' Donuts Park is still under construction, so the Double-A Rockies affiliate is opening the campaign with a 34-game road trip before playing its real home opener on May 12. At any rate, this four-game series in Richmond gives Flying Squirrels fans the opportunity to adjust to a sad new reality: Parker the Rally Pig has walked away from the game. 4:08 p.m. ET -- If you're looking for firepower on the first day of the season, you could do worse than tuning into Round Rock's game at Iowa right about now. The Express lineup will feature two of the game's best offensive prospects in Texas' Joey Gallo and Nomar Mazara. In particular, Gallo has perhaps the game's best power tool this side of Giancarlo Stanton and is looking to tee off after hitting 14 homers in 53 games at the Triple-A level in 2015. The I-Cubs aren't likely to be slouches either, even after the Chicago system graduated uber-prospects Kris Bryant, Addison Russell and Kyle Schwarber last season. Catcher Willson Contreras appears most likely to make a big impact with the big club in 2016, while outfielder Albert Almora has earned plenty of praise as a Top-100 prospect himself. Both should be in Iowa's lineup this afternoon for their Triple-A debuts. Maybe it's time for popcorn. 6:00 p.m. ET -- The Lakeland Flying Tigers' home opener should be of special interest to fans of classic baseball stadiums as this season the Florida State League franchise will operate out of 91-year-old Henley Field. The switch to this intimate 1,000-capacity facility was precipitated by extensive renovations to Joker Marchant Stadium, which also serves as the Spring Training home of the Detroit Tigers. Henley Field, also located in Lakeland, has a rich history. In its original role as a Spring Training facility, it welcomed the likes of Babe Ruth, Lou Gehrig and Al Kaline. The Flying Tigers will share the stadium with Florida Southern College's Division II baseball team. Florida Southern College is currently in the process of buying Henley Field from the City of Lakeland. 7:05 p.m. ET: Six hours after the Yard Goats' debut, another new team will be welcomed into the fold. The Columbia Fireflies, who relocated from Savannah following the 2015 season, play their first road game against the Charleston RiverDogs. The Fireflies -- the Class A affiliate of the New York Mets -- make their home debut on April 14 against Greenville. The team will play in brand-new Spirit Communications Park, located in downtown Columbia. In addition to witnessing the debut of a new franchise, RiverDogs fans also will enjoy the debut of several notable (and Charleston-centric) concession items. These include the Palmetto Biscotti shake (Biscotti cookie dough, vanilla ice cream, caramel syrup and Palmetto espresso porter), Shrimp-N-Grit Corn Dogs and a Chicken-N-Double Waffle Burger. 10:05 p.m. ET: For those on the East Coast, it might be getting kind of late, but things are just getting going in earnest out West. Three games start on MiLB.TV around this time, and none has more hype than No. 2 Houston prospect A.J. Reed's Triple-A debut with Fresno at Las Vegas. The 22-year-old slugger led the Minors in a host of categories, including homers (34) and OPS (1.044), in 2015. The fact that he's heading to the hitter-friendly Pacific Coast League should make for some interesting numbers once again, and the fact that his debut is coming at Las Vegas -- the PCL's fourth-most hitter-friendly stadium -- could mean those interesting numbers will come as early as Opening Night. There could be more where that came from as well with prospects Tony Kemp, Colin Moran and Jon Kemmer slated to join Reed with the Grizzlies. Buckle in. Friday, 1:30 a.m. ET: Time to turn in. Day 1 is in the books, but sleep well knowing so many more are still to come. Sam Dykstra is a reporter for MiLB.com. Follow and interact with him on Twitter, @SamDykstraMiLB. Benjamin Hill is a reporter for MiLB.com and writes Ben's Biz Blog. Follow Ben on Twitter @bensbiz. This story was not subject to the approval of the National Association of Professional Baseball Leagues or its clubs.